The Pre-sale for Play2Live‘s LUC token will start on November 20th, and go until November 26th. The token sale will begin December 4th and end December 10th. The way people seek entertainment has changed forever. And at the same time, Blockchain is in the process of changing the way people spend money. The economy is becoming decentralized, payments more secure, and the system transparent. Completely decentralized and founded on the Blockchain, Play2Live is the first streaming platform to bring eSports into the rapidly developing world of Blockchain. In P2L both players AND audience members earn tokens by doing lots of cool things like watching ads because of peer 2 peer cdn, advancing streams, and watching ads, if he wants. And there are other intellectual and revolutionary methods. Thanks to the Blockchain.The Play2Live platform with the Level Up Chan and Level Up Coin is taking over the world! Gaming will never be the same!! 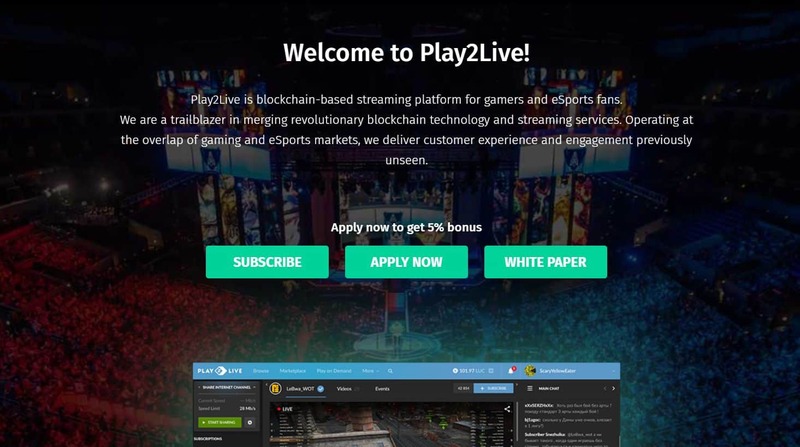 Utilizing some of the remarkable innovations of Blockchain tech, the team at Play2Live say they have developed an ecosystem wherein each participant, including the viewer, will be a part of a completely interactive system. Participants will be able to interact on a peer-to-peer basis with one another, and to earn money using many platform features. Audience members and streamers alike have the ability to earn and spend money doing what they love. Gamers love playing games, but they might like watching them even more. The eSports industry has already seen the rise of a number of gaming celebrities and millionaires, and viewership is already much higher for video game tournaments than for many traditional sports. Unfortunately, eSports streaming sites, like the ones listed above, have one major fault: They lack an effective platform for interaction between streamers and viewers. Fans are dying to be able to get in touch with their favorite streamers, and take part in the game on a deeper level, but at the moment this is impossible. That is, until now. A group of experts, with years of experience in eSports, game publishing, and developing high level online gaming services, has come together to find a solution. They have conceptualized the Play2Live (P2L) platform – the first decentralized streaming platform for gamers and eSports fans. By integrating the Blockchain into video game streaming, P2L is making interaction between gamers and fans easy, and making gaming even more fun and entertaining for everybody. On the business side, P2L is monetizing game streaming and creating an entire infrastructure for fans to spend money in order to interact with their favorite streamers. Due to the use of the Blockchain, P2L managed to increase the number of revenue sources on the platform from 5 sources at traditional centralized solutions to 15. Try to think of another Blockchain project that allows users to spend tokens inside any project in so many ways! “This will radically and forever change the industry. At the same time, P2L is likely to have a great impact on eSports and gaming, giving new opportunities for the so called Let’s play streamers that just stream games, and for organizers of eSports tournaments. Play2Live gives you, and other users all of the world interaction at a whole new level. It is truly a level up in gaming,” stated one team member. According to documents, the key advantage of the Play2Live system is that they are a complete ecosystem and not a service solving only one or a few highly specialized tasks. P2L is an independent generator of gaming and eSports content and a potential partner for other eSports platforms. This means they can continually integrate new products and partners into the service who will be able to interact with the platform’s audience through the “Level Up Chain” Blockchain. At its base, P2L is an e-marketplace, operating using a Blockchain-based token – the Level Up Coin (LUC), and a streaming platform, enabling access to share video streams. The marketplace enables the ultimate in interaction between streamers and their audience. Streamers can use the platform to build and maintain a fanbase, and make money doing it and making streams – right from the start without any applications forms or complicated procedures. Viewers can spend LUC to interact with streamers, and earn it by voting for the streams that they like. The more positive votes, the more LUC earned. Sharing streams becomes a way to earn. It will be possible to make specific requests, or choose from streamers’ custom-made options. For example, if fans want to see a streamer switch from “difficult” to “hard” mode on a game, they could give the streamer LUC in exchange for doing so. They could tell a streamer to “level up” with LUC, if they so please. Fans can also get together and form a crowdfund to pay for the content that they want to see. They can earn money by watching ads, if they want. There are lots of the other ways for streamers to earn LUC, such as by selling advertisements or taking donations. Viewers Eventually, the platform will support the placement of bets by viewers of eSport tournaments. All the innovative features of P2L are made possible by Blockchain, a decentralized technology that renders transactions secure, convenient, and transparent. P2L uses a custom built Blockchain called Level Up Chain. Since it was built using Graphene technology, these transactions will go at light-speed -50,000 TPS – hundreds of times faster than Bitcoin and Ethereum transactions.